Reposted from Museum Questions, a blog authored by Rebecca Herz that is dedicated to questions about museums and thoughts on creating a reflective practice. It has long been recognised that museums are educational institutions and that their school audiences are critical in both sustaining visitation and, through offering a positive and inspiring experience, can influence lifelong museum visiting habits (Falk and Dierking, 1997). This report outlines the evidence for student learning in museums under the frame of the contextual model of museum learning (Falk and Dierking, 1992, 2000), coupled with review of published studies primarily drawn from the work of DeWitt and Storksdieck (2008) and Groundwater-Smith and Kelly (2003-2011). Given the parameters of this review, the focus is on the physical museum space, coupled with the role of the teacher and museum staff. For more information about the impacts of the online and mobile spaces on educational activities see the list of resources at the end of this report. Field trips offer deep cognitive learning beyond facts and concepts to include process skills and draw on other places of learning such as museums. Learning on a field trip is a valuable supplement and addition to classroom instruction and a way to prepare students for future learning (DeWitt and Storksdieck, 2008). Students are more likely to remember social and personally relevant aspects of field trips, yet also dislike and keep less favorable memories of these trips that seem overly structured and leave little room for their personal visit agenda (DeWitt and Storksdieck, 2008). Based on the elaborateness of children’s descriptions it was concluded that high personal involvement, links with the curriculum and multiple visits to the same institution embraced long-term learning impact (DeWitt and Storksdieck, 2008; Wolins et al, 1992). Affective outcomes, such as increased motivation or interest, sparking curiosity or improved attitudes towards a topic, may be more reasonable given the short-term nature of field trips (DeWitt and Storksdieck, 2008). Visits to science centres can positively impact attitudes towards science for students who are already interested in and engaged with science (Jarvis and Pell, 2005). Students felt that in order to be substantively engaged in cognitive learning they needed to: know how things worked; be able to think through ideas; have opportunities to ask questions; be able to handle, manipulate and closely examine artefacts and exhibits; be able to seek out information from several sources in language that is appropriate to their age and stage of development; and be stimulated through all their senses (Kelly and Groundwater-Smith, 2009). When looking at emotional learning, students expressed a desire to be emotionally connected, while at the same time not emotionally confronted. The students in this study indicated that they welcomed opportunities to be fully engaged with provocative questions, fascinating and puzzling exhibits and clear, well-structured and accessible information (Kelly and Groundwater-Smith, 2009). In the majority of cases the aspect of the field trip that was recalled subsequently was the content and/or subject matter presented during the field trip (Falk and Dierking, 1997). Even after years had elapsed, nearly 100% of the individuals interviewed could relate at least one thing they learned during an early-elementary-school field trip, and most could relate three or more things (Falk and Dierking, 1997). Students retained information about sharks from an exhibition in a marine park in Italy up to three months after a visit (Miglietta et al, 2008). Sixteen months after visiting a science centre in Israel students recalled facts and details of their visit such as exhibitions, activities and guides’ input (Bamberger and Tal, 2008). Students are more likely to remember social aspects of their visit. The social interaction occurring on a field trip is an important part of the experience and supporting students’ in sharing their experiences enhances learning (DeWitt and Storksdieck, 2008; Kelly and Groundwater-Smith, 2009). Students like learning with their friends. While they recognised that a visit to the Museum was primarily designed by their teachers to assist in their learning, they also wanted it to be a satisfying social occasion when they could learn with and from their peers (Kelly and Groundwater-Smith, 2009). Visits are highly social experiences for students. A study of sixth graders stated that they had more control over their own learning when interacting with their peers rather than adults who tended towards control (Birney, 1988). A study of student talk found that school visits to museums assisted in building relationships between students through cooperative interactions and discourse (DeWitt and Hohenstein, 2010). Students wanted to feel safe and comfortable and to move around readily unimpeded by a number of prohibitive signs. They also wanted areas to be well-lit and inviting and find physical spaces scaled to their ages and needs (Kelly and Groundwater-Smith, 2009). The novelty of the setting may distract from students’ conceptual learning if novelty is strong (DeWitt and Storksdieck, 2008). To maximise cognitive and affective outcomes field trips need to provide moderate amount of structure while still allowing for free exploration. Well-designed worksheets can be effective in promoting discovery-based enquiry if exposing students to a wide range of relevant information. Well-designed worksheets may tap into already available interpretive material thus extending the richness of information. The use of pre and post visit activities can enhance the cognitive and affective learning outcomes. In a museum setting structure experiences, such as guided tours, specific detailed tasks can increase cognitive learning but may dampen enthusiasm. Structure, including worksheets, may limit the ability for students to explore and engage with the unique aspects of the museum setting. Based on a rage of studies, McManus (1985) recommended that worksheets should be designed to encourage observation, allow time for observation, focus on objects not labels, be unambiguous about where to find information and encourage talk. Photo by Universal Pops at Flickr.com. Photograph of a school group on tour at the North Carolina Museum of Art viewing “Sir William Pepperrell and His Family (1778, oil on canvas) by John Singleton Copley. Teachers value museums as sources of rich learning and social experiences (DeWitt and Storksdieck, 2008; Falk and Dierking, 1997; Groundwater-Smith et al, 2009). Teachers’ agendas for the trip will influence their subsequent classroom practice (DeWitt and Storksdieck, 2008). Research reveals that teachers have complex and comprehensive reasons for field trips, valuing these as learning and educational opportunities and as chances for social and affective learning (DeWitt and Storksdieck, 2008). Teacher motivations for school trips include connecting with classroom curricula, providing a general learning experience, enhancing student motivation, exposure to new experiences, change in setting or routine and student enjoyment (Kisiel, 2005). Students with teachers who were both enthusiastic about science and engaged in extensive follow-up activities expressed more positive attitudes towards science after their museum visit than students in other classes (Jarvis and Pell, 2005). Becomes familiar with the setting before the trip. Orients students to the setting and agenda and clarifies learning goals. Plans pre-visit activities aligned with curriculum goals. Plans and conducts post-visit activities to reinforce the trip and enables students to reflect on their experiences. Limited research has been undertaken into the role of museum educators in school visits and researchers are only beginning to examine the role of the museum in the student visit (Griffin, 2004). However, of the literature consulted it is clear that collaboration between teachers and museum educators and other staff in program development brings positive results in terms of enhanced outcomes of student visits and in strengthening relationships. DeWitt and Storksdieck (2008) report that teachers’ goals may not be the same as those of museum educators which, in turn, can cause confusion and impediments to learning. Teachers also may have multiple goals for the visit, whereas museums may be too focussed on the logistical aspects of the visit, such as wayfinding, parental consent, safety forms, transportation, financial transactions and orientation (DeWitt and Storksdieck, 2008). When programs are developed in alignment with school curricular and teacher goals rather than the museum’s objectives, integration of the visit into classroom practice is more likely (Xanthoudaki, 1998). Successful museum-school collaborations are often characterised by the museum reaching out to teachers and developing material in conjunction with them (DeWitt and Storksdieck, 2008; Groundwater-Smith et al, 2009). Australian Museum staff who had participated in the 2009 Teachers’ College found this had a positive impact upon all participants, and that teachers had a great deal to offer in the way of advice. Staff felt that they had benefitted in terms of getting close to their audience; learning about how the Museum could better engage teachers and students; networking and connections made to enable further discussion and consultation to take place; and stimulating new ideas for programs (Kelly and Fitzgerald, 2011). Visit this page for a full copy of this report. Featured image by Universal Pops at Flickr.com. 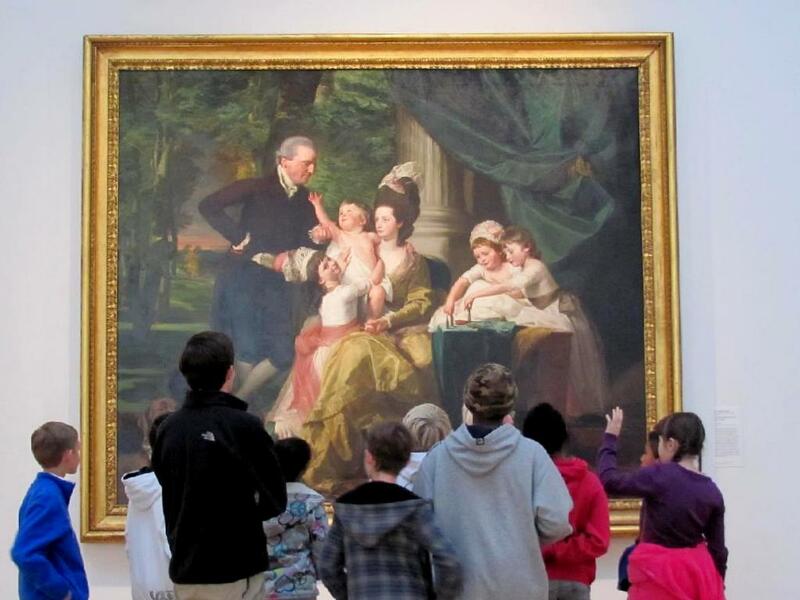 Photograph of a school group on tour at the North Carolina Museum of Art viewing “Sir William Pepperrell and His Family (1778, oil on canvas) by John Singleton Copley.